I really, really, really love this cake. It started as a vanilla cake with pears and dark chocolate chunks, and sometimes I still make it that way. But the next few times I tried it—and I made it often during the holiday season—I went with a chocolate-on-chocolate version instead. This double vegan dark chocolate pear cake is now my go-to, the one I made for Chanukah and on Christmas Day. I’m happy to make it this year’s Valentine’s Day offering to myself. I had high hopes the first time I made the cake, but even so, I was pleasantly surprised at how well it turned out. Chocolate and fruit is a hit-or-miss combination for me: I love chocolate and raspberries together, but I’ve never really loved chocolate and orange. Most of the time, I like for chocolate cake to be simple and relatively unadorned: maybe a swirl of good frosting (this one is an all time favorite), but that’s about it. This cake, though, was love at first bite. The pears give it moisture and delicate sweetness, somehow managing to stay in balance with the rich chocolate flavor. I fold half of the pear into the cake batter itself (if you fold all of them in, they tend to sink too much) and top the cake with the rest, along with a very generous layer of dark chocolate chunks and a dusting of sugar. The cake is refined-sugar-free without that dusting, so it’s optional if you’d prefer to skip it. But I have to admit that I love the crispy, slightly caramelized topping it creates, which you can probably spot in the photos. I based the cake itself off of a Peter Berley recipe from The Modern Vegetarian Kitchen, one that has served me very well in the past. It makes for a runny batter, and it’s important to let the cake bake until the top is truly set before taking it out of the oven. If you take it out too early, it’ll collapse, especially with the weight of chocolate and fruit. I usually give it a full 45 minutes, though I’d recommend you start checking at the 40 minute mark. When the top feels set (gently tap it with your finger to see) and is rounded, the cake is ready. If you need to give it up to 50-55 minutes, that’s OK. Here’s the recipe. Preheat your oven to 350F and lightly oil or line a 9 inch springform cake dish with parchment. In a large mixing bowl, whisk together the flour, cocoa powder, baking powder, baking soda, salt, and cinnamon. In another mixing bowl, whisk together the syrup, water, oil, and vinegar. Add the wet ingredients to the dry ingredients and whisk to combine thoroughly, but it's OK if there are a few small clumps. Fold half of the pear into the cake, then pour the batter into the pan. Top with the remaining pear and the chocolate. If you like, sprinkle a tablespoon of sugar over the top of the cake. Transfer the cake to the oven and bake for 45 minutes, or until the top is rounded and set. Remove it from the oven. Allow it to cool for a whole hour, then you can release it from the springform pan. I recommend allowing it to cool for another couple hours before slicing: the dark chocolate will be very melty at first, and it's better to give it some time! Enjoy. *You can use the same amount of a trusted GF, all purpose flour blend. The cake is such a wintertime treat: chocolatey but not overly rich, sweet but not cloying, and the dark chocolate chunks make it feel fancy and festive in spite of the fact that it’s really pretty easy to make. You can definitely try the cake with a gluten-free, all purpose flour blend; I haven’t tried that yet, but I strongly suspect it’ll work. Just opt for a brand or homemade blend that you really trust and have had good experience with making 1-to-1 substitutions in the past. As I mentioned on Sunday, my work this month is to stay open, soft, and loving, which includes sending a lot of love to you all for February 14th, and in general. Have a happy Valentine’s Day, if you feel like celebrating it, and I’ll be back at the end of this week with an enthusiastic review of Hannah Kaminsky‘s latest vegan cookbook masterpiece. I love dark chocolate and I love cake without frosting, so you can say how much I am loving this particular cake of yours. And those pears in between.. delicious! My goodness Gena you’re amazing. This looks incredible. The second the weather starts to cool down here in Aus i’m making this beautiful cake! OH YUM!! What a beautiful way to celebrate love – for oneself and others (even if the others are not in the same room). I will be making this cake soon. this looks dark, moist and delicious! I’ve never thought to mix pears and chocolate. Looks delicious! This sounds amazing! I definitely want to make this. This is the first time I’ve had the courage to comment on your website. This week, I’ve been really enjoying eating this cake so I had to speak up!! It came together so quickly and easily. Pears are not in season here in Japan, so I used blueberries and a handful of walnuts – delicious. Can’t wait for the pear season to roll around – I can imagine just how delectable this combo will be. Thank you!! I had to buy a springform pan to make this cake and it was 100% worth it! It was so delicious! Incredibly moist and flavorful! Everyone I shared it with loved it! Thanks so much for the awesome recipe! When you make the vanilla version of this cake, do you change anything other than leaving out the cocoa powder? The kind of cake we like in my home, we’re not big on frosting. This cake looks so delicious, I’m sure it won’t last very long in my house. Your cake looks so chocolaty! and yummy of course! Adding pear to the cake is a very new and interesting idea. I’m sure it will add a great flavor to it different from how every chocolate cake tastes like. Another interesting thing is that you have used maple syrup instead of the usual granulated sugar! I’m sure it will really enhance the flavor. Need to try this out very soon. I made this and it came out so good! I used vegan chocolate chips on top and it worked perfectly. The cake is moist but fluffy and so delicious. Also if you don’t have a spring form pan, don’t worry! You can just use a glass pie dish and it will come out great, just remember to grease it. I would love to try this with strawberries instead of pear sometime. Looks delicious. I will try to make a weekend. Thank you so much gena. 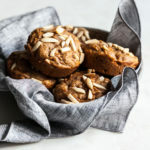 This looks lovely and I’m keen to try it this week I was wondering if it would work as muffins rather than one single cake? Would the oven temp or timings need altered? I think it might work. I’d try the same temperature for 22-25 minutes. I hope it turns out well! I’m wondering if I could make this with spelt? Totally fine that that means it would be be more dense than with all purpose but just wondering if I should use the same amount? Hi Gena! I’ve baked this once, it was amazingly moist 🙂 was looking at your note, and was wondering if you have tried substituting with a GF flour blend before? Thank you!! I haven’t tried it myself with this cake, but if you use a blend you’ve had good results with in the past, I would imagine it’ll work nicely! Glad you enjoyed it. This was great! Made with cardamom instead of cinnamon but no other changes. Brought it to a dinner party and everyone loved it. The crunchy topping is wonderful! A lovely cake! Not too sweet, and a great texture. 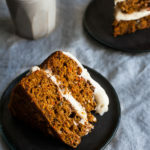 Perfect for coffee and tea, or a slice in the evening after a cozy meal! Next time, I’ll add 1.5 pears, as I loved the burst of sweetness and moisture from the chunks! Used an alkalized cocoa, but imagine a natural cocoa would bring out the fruity notes in the pear. Delish! Thank you for sharing!! Reading about this cake is making mouth water now. Looks absolutely stunning! This is delicious, very light and great texture. Thank you. Thanks for sharing Gena. I’ve always had this love-at-first-bite thing with chocolate pear cake. I first prepared it during the spring of 2013 and there is no week that passes by that I do not take make it at least once. But the weird thing is, my approach is kinda different from yours. I’ll definitely try yours as well. Restaurant type of cake. Very nice. Thank you for separate making box and have the print option. It’s lovely. I glad to read this.